C. 1850 - The River Teign, from Brecknock Hill, Newton Abbot showing its route to Teignmouth. In 1583 Humphrey Gilbert – a local adventurer who lived in Compton Castle, Marldon just a few miles from Newton Abbot. – landed at St John's in Newfoundland and claimed the area as a British colony. The fisheries quickly developed. Between 1600 and 1850 there was a steady trade between Newton Abbot and the cod fisheries off Newfoundland. Every year men from the town would gather at the Dartmouth Inn or Newfoundland Inn in East Street in the hope of being hired for a season's work. In the autumn the dried cod was stored in depots and sometimes used as payment. There was considerable economic spin off from this trade. Fish hooks, knives, waterproof boots were all made in the town as was rope making. The Rope Walk still remains in the town together with the names of Newfoundland Way and St John's Street. Trading was intensified when Templar built the Haytor Railway and the Stover Canal. This enabled granite from Haytor and clay from the Bovey Tracey/Kingsteignton area to be exported to the potteries in the north of England and London, as well as exporting to other countries. The goods would be taken by barge down the River Teign to Teignmouth, a then bustling port. The Yeo family of East Stonehouse seized the opportunity and various rope making family firms were set up. The progenitor was Samuel Yeo who was baptised on the 28 May 1733 in St Blazey, Cornwall and married Margaret Thompson on the 21 Sep 1765 in Plymouth St Andrew. Their children, William , born 1766, Ann , born 1768, Margaret Hill , born 1770 and John Richard , born 1773 were all baptised in East Stonehouse. Their eldest son William married Mary Hart in 1791 when he was recorded as being a shipwright. They had five children all born in East Stonehouse, William (1792), MaryAnn (1796), John (1798), Samuel (1799) and James who died in 1804 at just two years old. William died in 1802 so Mary was left a widow with four young children to support. It is quite probable she remarried. William married Susannah Hearder on the 9th Aukgust 1816 in Tormoham. Susannah was born in 1790 in Cockington, Devon and was the granddaughter of the Reverend Hearder, vicar of Cockington Parish Church.. They had eight children, Susannah Hearder, (1818), MaryAnn (1819), William Hart (1821), Henry Hearder (1823), John Hart (1824), Sarah (1825), Samuel Hearder (1827) and George (1829). 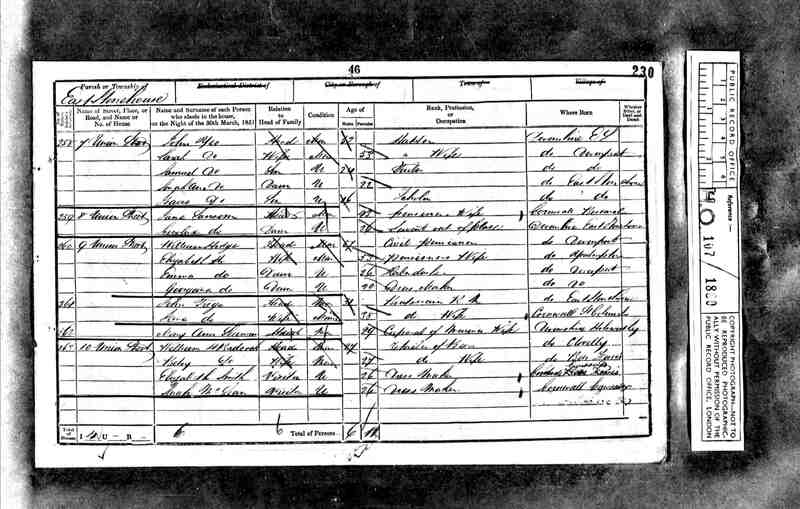 Except for John Hart Yeo, who was born in London, the children were born in either Teignmouth or Tormoham (Torquay) but were baptised in Bovey Tracey Methodist Church. MaryAnn married James Brewer on the 16th April, 1820 in Plymouth St Andrew. James was a ropemaker and their son John eventually inherited Rope Walk in Newton Abbot from his cousin Ephraim. John married Sarah Thomas on the 25 th June, 1820 in Plymouth Charles and was a Hatter living at 7, Union Street, East Stonehouse in 1851. 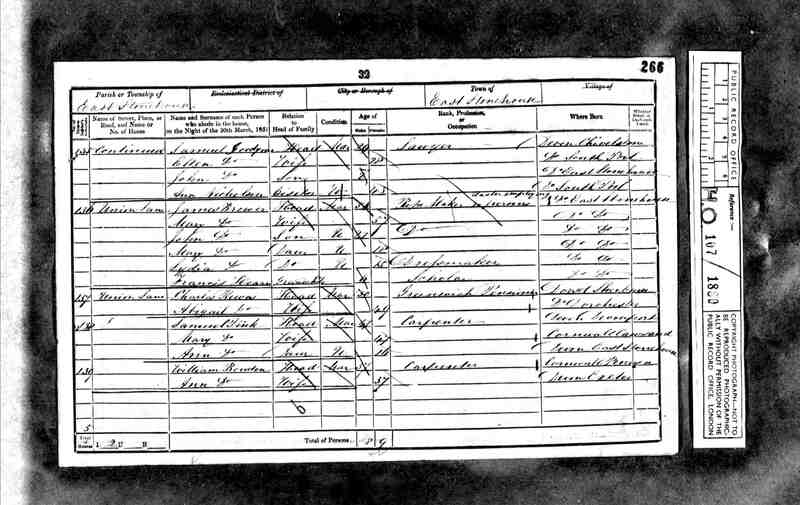 They had three children, Samuel Ebenezer (1828), Sarah Ann (1828) and Isaac Burney (1835). Samuel became a tailor but died in 1856 at just thirty years old, Sarah also died young in 1863 but Isaac Burney became a distinguished physician in London. Samuel married Eliza Newman on the 21 st February 1832. The Newman family were also ropemakers in East Stonehouse and were Plymouth Brethren. Samuel moved to Newton Abbot and founded the rope making business in East Street. Michael & David Yeo, sons of the Reverend George Henry Yeo, MBE, Ann Philippa Rowe, nee Yeo of Bristol, daughter of Stanley Colston Yeo, for sharing their family history and William B Lister of Southport, Merseyside who provided the information on the Newman Family relationship to Samuel Yeo..